Today I wanted to share with you an interesting experience about using comics to help students with their first login to our e-classroom. Let me do by explaining a bit of background to the story. Many of the courses at out faculty are in some way or another supported by our e-classroom (based on Moodle) and so most of our students need the access to our e-classroom to get study materials or participate in other study activities. For their first login students are asked to enter their unique student number as their username and password (which they can of course change later). This works for most of the students, though some students (like those that enrolled after the official beginning of the study year) don’t yet have an account created, because they weren’t included in the transmission of student data from the faculty’s information system. Yes sure, we could figure out a better way to automatically create student accounts, but the current system works well for most students. Now, all I’ve just described above was clearly explained to our students on the first page of our e-classroom. We provided students with short and concise instructions on what they should do on their first login and what they should do (email our Center for e-learning) if that didn’t work. We thought the instructions were clear enough, but a great number of students disagreed. We were getting a dozen mails per day by confused or frustrated students that couldn’t get in the e-classroom and were asking for help. Many mails did not include the information we asked students to include when asking for help. And we saw that as a big problem. Clearly, too many students were not able to properly understand (decode) the given instructions. Also, they were experiencing confusion and frustration, which is definitely not something you’d want students to experience when first meeting a new technology. First impressions matter, right? 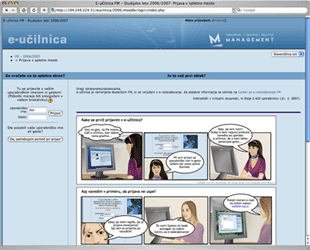 And I was actually surprised by the fact that the comic almost immediately helped to lower the number of mails we receive and that students requesting login now included all the required information (just the way the girl in the comic does). Wow! I didn’t believe it would make such a noticeable difference, but it does. It seems that our students pay more attention to the content of the comic than they did to the content of the written instructions. No serious research has been done about this (at least yet :) ), but a few students already responded to the short survey about the comic that we posted in the e-classroom and they all said the instructions in the comic are easier to understand than the written ones before. So, the reason for which I’ve decided to share this experience with you was that it has reminded me that we sometimes have to look outside the box to find a better solution to our problems and that too often we forget how valuable pictures and illustrations really are. For students that are faced with a new environment I guess it’s easier to understand a comic that shows a similar situation to what they’re experiencing in the same moment. It is after all in human nature to learn from observation and also to feel closer to content that has “a human face”. Spoken or written language is a great and powerful way to communicate, but we must not forget other forms of communication, especially the visual. I should know that - after all, I do have a bit of background in graphical design. I was also reminded about this by Stephen Downes, who wrote that he really liked my “Click. Learn. Share.” icons (and I even got a mail about them this morning :) ). Sometimes words just are not enough and we should never forget that we have many powerful ways that can help our words to be heard - especially in the noise of everyday life. I think that can be a challenge for all of us, but especially for educators. Verbalized textbooks have ruled the past, but we need to learn new forms of communication. I think this will be increasingly important if we’ll want to get the attention of the digital natives that are slowly taking over the world and that are discovering the power of visual communication through YouTube, MySpace, Flickr and other visual channels. I think the proper way to end this post is to ask all of you to share your stories of how words were not enough. Why should this be done? To inspire new experiences and to serve as a reminder that creative solutions are key to the challenges of the 21st century.